The Midnight Express is one cigar I heard a lot about. A number of bloggers and cigar media people I respect put this cigar as one of their favourite Caldwell offerings. Caldwell is a brand that I always have to try, so I spent months tracking this cigar down. After some dead ends, I finally have it and the Midnight Express is worth the wait. This spinoff of the Eastern Standard was officially launched at the 2016 IPCPR show. Unlike other maduro spinoff cigars, the Eastern Standard Midnight Express is as close to the original as possible. 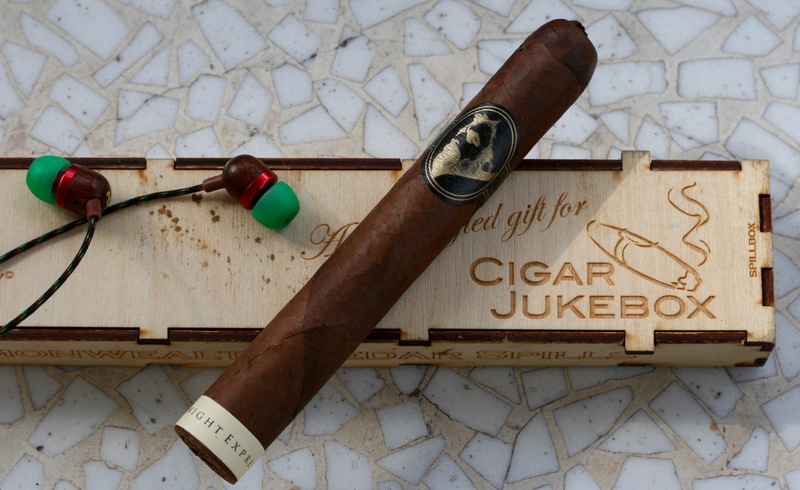 The filler percentages are tweaked, but the wrapper is a maduro of the leaf of the original Eastern Standard wrapper and the binder is the same. The cigar has a neat little man bun pigtail on the top. For more information on the Midnight Express, head over to Leaf Enthusiast. I purchased 5 of these from Smoke Inn. To start off, I am in love with this cigar. There is this unique malted, cocoa, marshmallow type note that I have not found in any other cigar. It is a rich and complex cigar with great flavour and body. I went with a bit of a midnight theme for some of the songs and went off on a different take with the final two. I wanted something old school with a great vibe to it. However, it needed to have a good groove and soul to it to match the rich note of the cigar. I decided to go with Gladys Knight and the Pips with Midnight Train to Georgia, because it ticks all the boxes. The next track is a classic midnight song. It also ticks all the boxes for the Midnight Express. The song has a great beat, some edge and it is a banger. So, smoke this Caldwell cigar and blast some old school Ice – T and Midnight. This next track is something that embodies the creativity and uniqueness of Robert Caldwell. I wanted something bangin’ that was different, but still fit the cigar. M.I.A.’s new track is just the thing. Her track P.O.W.A. has the creativity and beat to fit the bill. The last song is something that represents the dark notes of the Midnight Express. The cocoa, malt and hints of sweetness gives this cigar a dark quality that is fantastic. I went with a Leonard Cohen song that really suits the cigar. I went with a track that would end up being off of Cohen’s final record. This is You Want it Darker. I know I came late to the party, but add me to the long list of people who put the Midnight Express on the top of their Caldwell list. I have smoked five of these thus far and each one has delivered big time. The cocoa note with that malted / marshmallow flavour is an amazing combo that has to be experienced to be understood. Great job Robert, this cigar has me very excited to see what else Caldwell is going to unleash on the cigar public.